A little more than halfway through 2018, Trump administration officials are on track to significantly increase their promotion of the president’s businesses compared to the first year of the Trump presidency. 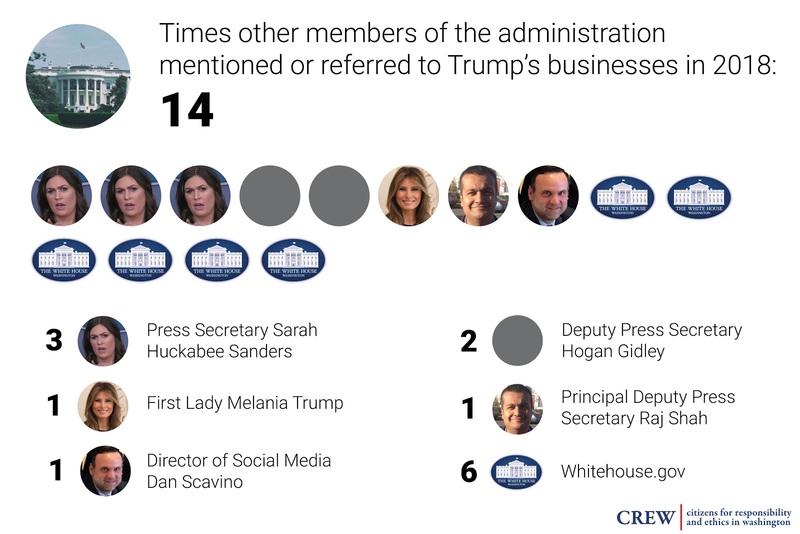 According to an analysis by CREW, during President Trump’s first year in office, he and other members of his administration made public reference to Trump brands and businesses on at least 54 different occasions. 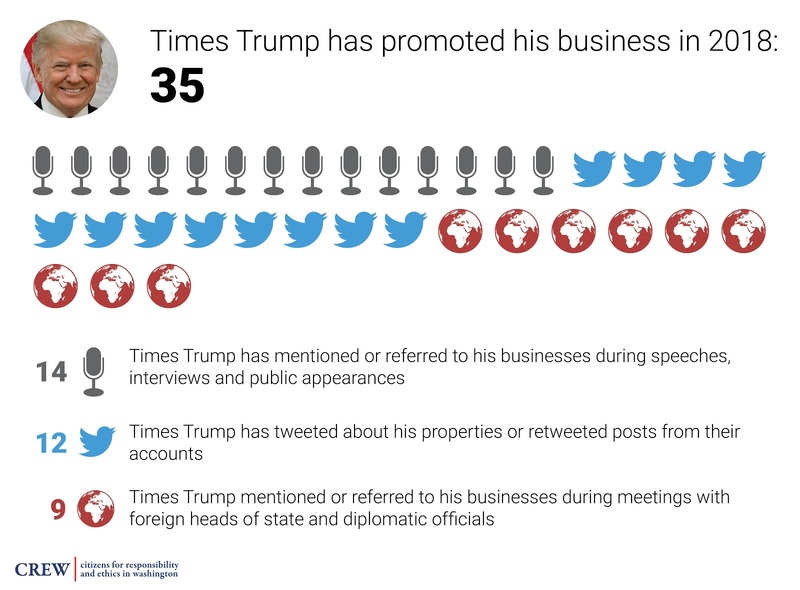 So far in 2018, between January 20 and August 11, administration officials have already made statements regarding Trump brands and properties at least 49 times. At this rate, the administration’s promotion of Trump properties in year two of the Trump presidency will far exceed the amount of promotion that occurred in President Trump’s first year. Increasingly, the Trump administration’s promotion of Trump businesses resembles nothing more than an extensive marketing campaign—one that is utilizing taxpayer-funded government resources in order to add to the president’s bank accounts. As CREW Executive Director Noah Bookbinder noted in January of last year, President Trump’s refusal to divest himself from his businesses presents a unique ethical dilemma. Prior to his inauguration, the president-elect placed his assets into a trust with himself as the sole beneficiary, rather than divesting completely from his family business as then-Office of Government Ethics Director Walter Shaub advised. As a result of this half-measure, even after taking office, President Trump has continued to make money off of Trump Organization properties and brands, creating the potential for vast and unprecedented conflicts of interest for a sitting president. With this in mind, CREW has been tracking and cataloging every instance in which government and special interests have interacted with the president’s private businesses since he took office. On Twitter, as well, President Trump has continued to promote his properties. When a fire in Trump Tower claimed the life of one of its inhabitants in April, the president insisted on Twitter that the building was “well built.” After former First Lady Barbara Bush passed away, President Trump tweeted that he was heading to Mar-a-Lago to watch her funeral, calling the resort the “Southern White House.” On other occasions this year, the president has tweeted about his Doral and Turnberry golf courses (retweeting Turnberry’s official Twitter account in the process), as well as the Trump International Golf Club in Palm Beach. For those working in the Trump administration, the basic functions of government often intersect with the president’s private businesses in ways that essentially require them to promote those businesses. For example, before President Trump hosted Japanese Prime Minister Shinzo Abe at Mar-a-Lago, Press Secretary Sarah Huckabee Sanders mentioned the club by name in her official statement announcing Abe’s visit. Later that month, following Barbara Bush’s passing, Sanders informed the White House press pool that the flags at both Mar-a-Lago and the Trump International Golf Club in Palm Beach had been placed at half-staff. This flag-lowering was a response to news reports asking why the flag at the so-called “Winter White House” hadn’t been lowered. More recently, White House Director of Social Media Dan Scavino Jr. tweeted about the president’s Bedminster golf club during an official visit to the site. So why has the Trump administration’s promotion of the president’s properties accelerated in 2018? One factor may be that the administration simply isn’t being as cautious about avoiding the appearance of a conflict of interest as it was in 2017. President Trump’s latest financial disclosure, which covers the year 2017, also offers another possible explanation: the Trump brand is struggling, and the president may be trying to compensate. At some Trump properties, such as the Trump International Hotel in Washington, DC and the president’s golf courses in Scotland and Ireland, revenues appear to have increased last year. Still, it’s unclear whether those golf courses are actually profitable. Meanwhile, during the same period, analysis of President Trump’s financial disclosures suggested that Mar-a-Lago experienced a 10 percent decline in revenue in 2017, and business at the Trump National Doral golf resort, the Trump Organization’s biggest source of revenue in recent years, suffered. (Last year, similar declines were reported at several of the president’s other golf courses.) Given this context, it’s possible that the administration’s increasing promotion of Trump brands reflects the president’s desire to turn his businesses around. 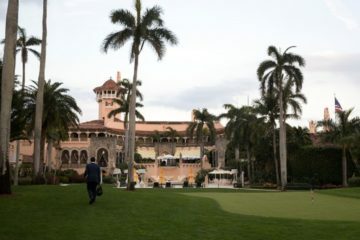 In a statement to The New York Times last month, CREW chairman Norm Eisen described President Trump’s recent visit to his Turnberry golf course as a “forced subsidy of an infomercial for his properties.” Indeed, as long as the president remains invested in his properties, such potential conflicts of interest are impossible to ignore: Is the White House engaged in a marketing campaign for the Trump brand, and if so, are Americans paying for it? On four separate occasions this year, President Trump has sought and received feedback from members and guests of Mar-a-Lago.